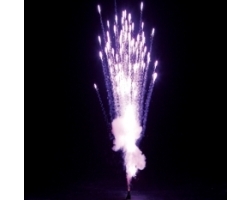 Le Maitre 20' Mine White - Code 1268, The Le Maitre Pyroflash 20' Mines produce a directional burst of brightly coloured stars projected to a maximum height of 20 feet. The le Maitre 20ft Mines are available in: Silver, Red, Green, Blue, Purple, Orange, Yellow, White, Flitter, Red with Tail, Green with Tail, Orange with Tail, Yellow with Tail. All colours are also available with crackle.